The Glengarry News, July 31st, 1958, pg. 1, col. 4 & 5. A service of re-dedication was held on Sunday at St. Andrew's Church, South Lancaster,in connection with the reconstruction of the church tower. The steeple was built in 1850 - 55 as part of the original construction of the"Stone Church". It reaches some 85 feet into the sky and is topped by a weathercock.. The tower bell had wrung faithfully down through the years, beckoning the worshippers to the House of God. It bears the inscription - "First Settlers, County of Glengarry, Landed With Their Pastor Rev. D. John Bethune 1784, Departed His Life 1815." There is some considerable doubt as to the historical accuracy of this statement since it is now known that Rev. 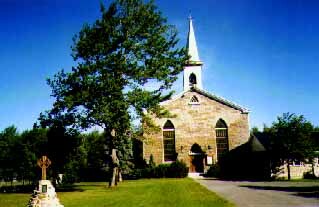 John Bethune did not arrive in Glengarry until some three years after the first settlers had made their way from the Mohawk Valley to this area, via Montreal. Mr. Bethune first settled in North Carolina (1773) and as a result of the Revolutionary war came to Glengarry (1787) via New York, Halifax and Montreal. With the installation of electricity in the church a light was placed in the tower window which had served as a guide to local fishermen plying their way home in the evening shadows. In 1950, an anonymous donor financed the installation of a loud - speaker system in the Church tower. This provided amplification for the music of the chimes and organ which can he heard throughout the surrounding community and often-times, wafted by the off-shore breezes, right across beautiful Lake St. Francis. Apart from minor repairs in 1950, the tower had apparently needed little maintenance since its construction. However, the weather had secretly taken its toll and it was discovered that the frame had been seriously weakened by rot. The need for immediate attention was presented to the congregation at the Annual meeting, and it was decided to proceed with the reconstruction of the tower without delay.